A long-time favorite. Fruits stays on the vine to maximize sweetness wtihout going soft or trading flavor for firmness. 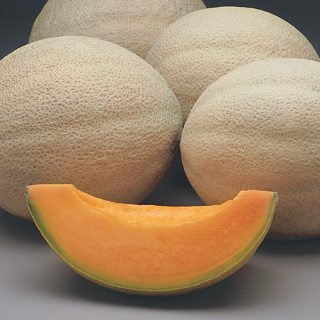 Aromatic melon with outstanding sweet flavor and hearty flesh. Superior disease resistance. 75 days. 5-6 lbs. Gc:1 (powdery mildew caused by specific races of Golovinomyces cichoracearum (ex Erysiphe cichoracearumI I Px:2 (powdery mildew caused by specific race 2(EU) I Tolerant: S (Sulfur burn caused by the appliction of some sulfur-based pesticides.